Use the unique Algopix demand analysis platform for Amazon, eBay, and Walmart online marketplaces to discover which items are in the greatest demand and will bring you the highest profits in each marketplace. By automatically calculating marketplace demand and selling prices, shipping fees, marketplace fees, fulfillment costs (like FBA), PayPal fees, and more, Algopix makes it easy to identify which products will be most profitable for your online stores. 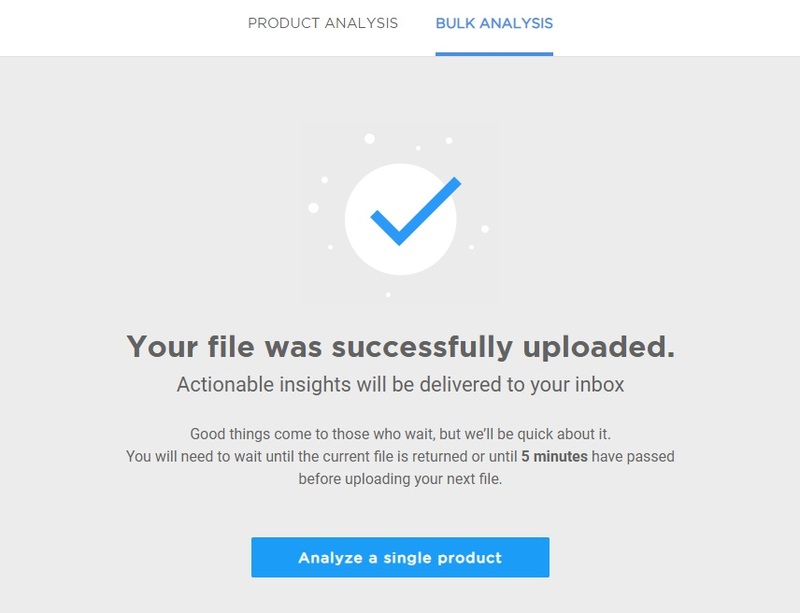 Algopix Bulk Product Analysis Research feature speeds up your research by enabling you to analyze hundreds of products and multiple marketplaces at once. 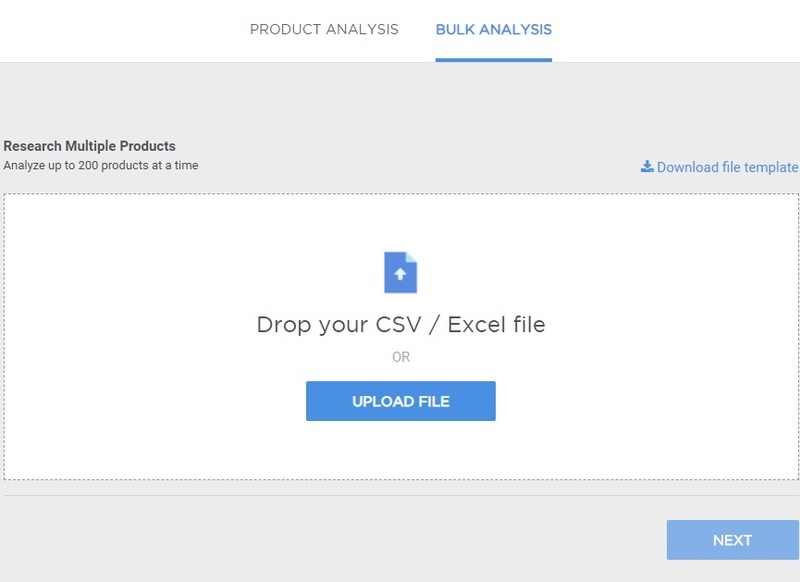 Enter an Excel or CSV file of up to 200 products into the Algopix Bulk Product Analysis feature and indicate the product identifier and purchase price fields. Choose the markets you wish to analyze, and the currency you would to like use. Then click SUBMIT. A detailed report of actionable insights will appear in your email inbox, showing clearly which products are in the highest demand and have the highest profit margin in which marketplaces. 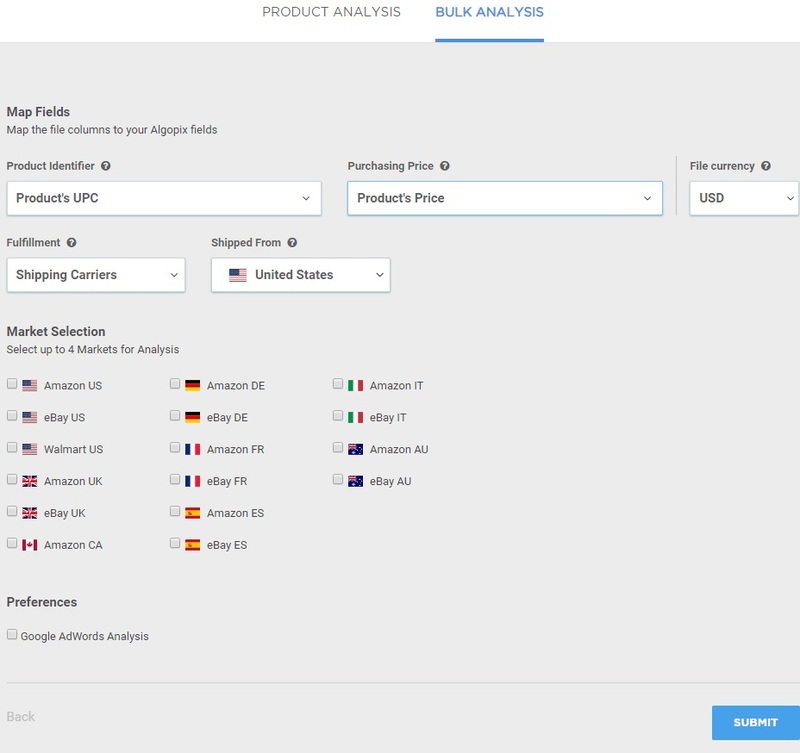 Why Use Algopix eBay, Amazon & Walmart Bulk Product Analysis Platform? The eCommerce space is crowded and extremely competitive. With so many vendors, products and marketplaces available, it can be hard to determine which products will bring you the greatest sales and profitability. By removing much of the uncertainty of involved in choosing your eCommerce offering, Algopix’s comprehensive research lets you feel confident that you’ve chosen the products with the very best chances of success, and that you are selling them in the most appropriate marketplaces. With Algopix’s unique bulk analysis, you can investigate up to 200 products with just a couple of clicks, gaining unprecedented insights into your product selections, and saving you significant amounts time and effort compared to manual product research. What are the best products to stock this quarter? Which are the best marketplaces for your existing stock? What brand or model is in the highest demand in your retail space? What is a reasonable price to pay your supplier for wholesale stock? Which are the best keywords to use in your Google AdWords campaigns? What are your competitors charging for the same products? Step #1: Before you start, make sure that your file contains the right information, and that it’s saved in one of the acceptable formats (Excel or CSV). It is recommended to clean other columns from existing files. What information does Algopix need from you? The most important information is the product identifier. We can use any kind of product identifier codes (UPC, EAN, ASIN, ISBN, MPN, GTIN, and more). We can even work with a detailed product description! Note, however, that results are typically more accurate when you provide a barcode identifier. You can also include a column showing the product cost to get a predicted profit margin, but it’s not necessary. You should eliminate other columns before uploading. You can upload (or drag and drop) files in either CSV or Excel formats. CSV is a plain-text file that is one of the most common formats for saving data in a spreadsheet. Typically, Microsoft Excel, OpenOffice Calc, and other spreadsheet programs let you save files to CSV format. Note that when saving as a CSV file, you need to choose the Comma Delimited Format option. Algopix Amazon, eBay & Walmart bulk product analysis feature also support files in standard Excel format, allowing you to upload price lists directly from suppliers without changing formats. 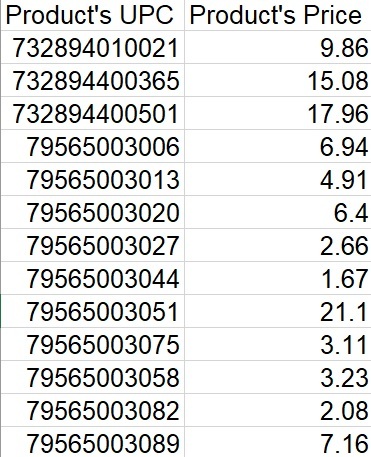 Note: Your CSV or Excel file may contain up to 200 products. You can analyze more products by creating separate files for each group of 200. For example, if you want to analyze 1,000 products, you will need to create and upload five files of 200 products each. Step #2: Go to the Algopix dashboard, and choose the Bulk Analysis tab. Step #3: Now it’s time to upload your file! You can either drag and drop the file from your desktop onto the Drop Your CSV File field, or click the UPLOAD FILE button and choose the relevant file from your device. Then, click NEXT. Select your Fulfillment method – either FBA & MCF or directly via an independent shipping carrier. Pick where your products will ship from (i.e. USA, UK, Germany, etc.). Select which markets you want Algopix to analyze. You can choose up to four markets each time. If you want Google AdWords Analysis, check this box. Step #6: You’re all done! Click SUBMIT and wait for your results to appear in your email inbox. Your results should appear in minutes. Once you get your first results, you will be able to upload your next file. Note, in cases where the analysis involves multiple marketplaces and many products, the results may take up a little longer. Make sure that your product information file is saved as a CSV (comma delimited) or standard Excel File, so that Algopix can read it correctly. Make sure the data does not contain any commas. Every product on your spreadsheet needs its own unique product identifier code. This can be a UPC, ASIN, ISBN, or MPN code. If you don’t have the product identifier code, or you want to use product titles instead of product codes, make sure that each product title is as detailed and accurate as possible, to help Algopix identify the correct item. Don’t forget to choose the relevant currency from the drop-down list. The estimated percentage of profit and amount of profit in each marketplace (when cost information is provided). Your Algopix Bulk Product Analysis Research report will arrive as an Excel spreadsheet, containing a lot of valuable information. Here‘s a guide to help you quickly understand and act on the information. The first two columns show the product title and original product identifier term that was provided. These help you identify each item in your original product list. The next few columns give you the most important information about the profitability of the products you are evaluating. You’ll find a simple Yes or No answer telling you if each item is recommended for sale in each of your chosen marketplaces. At this point, you can quickly and easily filter out items that don’t have a good profit margin in any of the marketplaces. This helps you narrow down your options before you continue. If you want to investigate the profitability of your products in more depth, you can examine the next few columns. These show the data that Algopix gathered to make its decisions, repeated for each marketplace. Algopix also provides the level of demand and the Amazon’s Rank for each product, so you can determine interest in your item. This is also important when considering whether or not to sell a given product. If you checked the box for Google AdWords Analysis, you’ll find columns presenting useful data for your Google AdWords campaigns. Algopix returns the recommended search phrase that performs the best, along with the monthly search volume, cost per click, and level of competition for the phrase. This gives you a head start when planning your product descriptions. Finally, Algopix saves you time by providing you with the product specifications for each item. Where available, you’ll see the brand name, model number, color, and product description for each product, along with its unique product identifier codes. Algopix also includes the full size and shape dimensions and the weight of each item. With this enhanced product information, eCommerce businesses can quickly and easily build up their product database. With product specifications from Algopix, you can make sure that your own data is correct, and use it as a basis for full and engaging product descriptions. How Does Algopix Bulk Product Research Analysis Work? We gather billions of data points from hundreds of millions of products on eBay, Amazon, and Walmart marketplaces across the world, collecting the expected retail price, shipping costs, product costs, level of demand, and other fees. Using our unique algorithms, we produce an accurate picture of your potential demand and profits so that you can make decisions with confidence. Why not test drive Algopix Bulk Product Research Analysis for yourself? Click here to try it out, and see the treasure trove of data that you can unlock in minutes.